I was so inspired when I came back from Minnesota, I wrote down some ideas for a studio of my own and things I wanted to share with my community and friends. How could I do what we did in a private school in Hopkins in a public school in Logan? How could I best help others see the joy in SAORI? How could I make my dream of a studio a reality? Those are questions I hope to answer in the coming year. 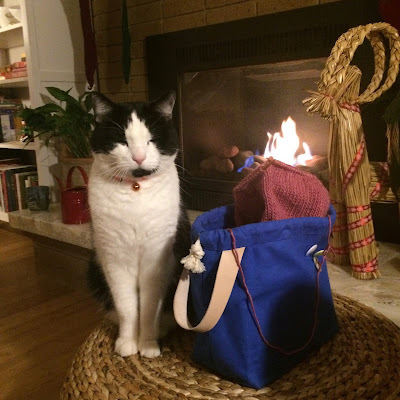 When I was in Chaska, Chiaki had said to me "SAORI is more than just a weaving. It's about LIFE. Weave every day." I am trying to weave every day. If I was going to do that much weaving I needed to make some of my own warps to try and remember all I learned from Laura in LA. 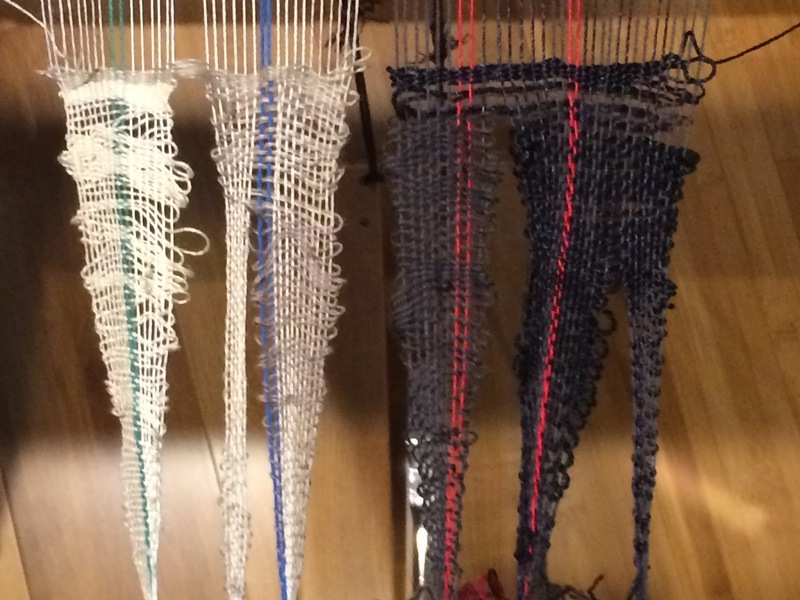 I set my warping board up and created 3 different warps, each around 6 meters long. The last warp still needed to be woven. I wound 3 different warps all about the same size. I had gathered some yarns and had some ideas in mind for the weaving. The interesting thing is I did these around the first of November and only one of them was woven before Christmas. 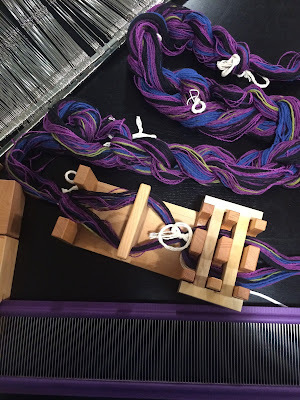 I have since put all the yarns I gather away and now that I am threading the warps on, they are becoming something different from what I had in mind back in November. Another warp in the cross holder, ready to be threaded. 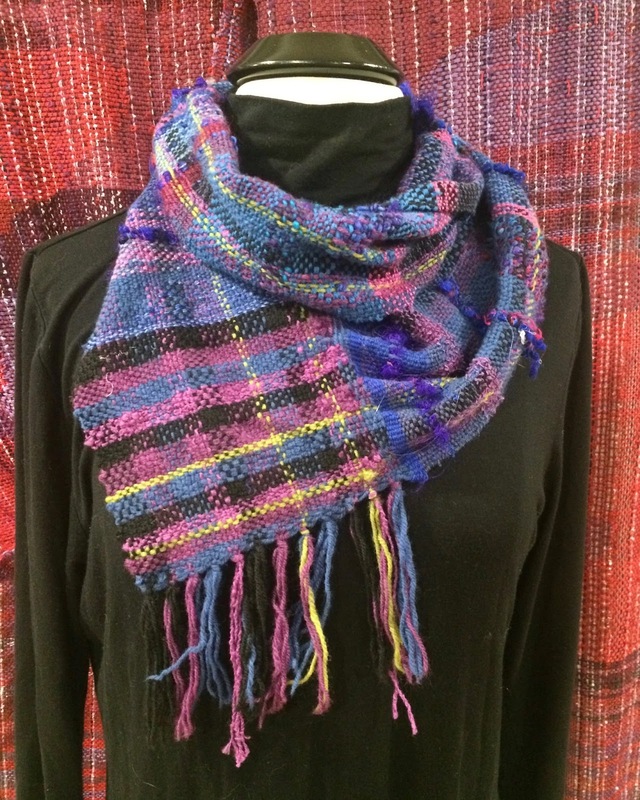 This is this the one that I threaded on and was woven first. 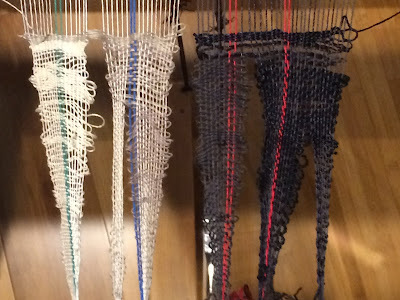 It became a very meditative process, winding and threading the warps. I would block out 3-4 hours when I would be uninterrupted to do this process. 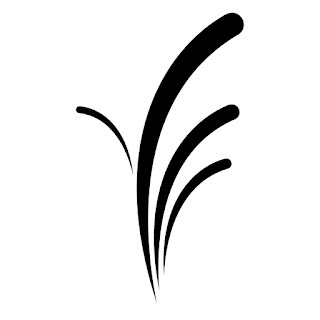 Both for the meditative aspect of it and also so it could be completed all at one time. Less risk of a disaster that way. One of the scarfs from the warp above. Then Jakob, my oldest son saw me winding a warp and said, "You should do a Star Wars warp" I asked what he meant and he told me to do the Light side versus the Dark side. Asked a few more questions about the light saber colors and their meaning and who had what color. That was all the inspiration I needed. 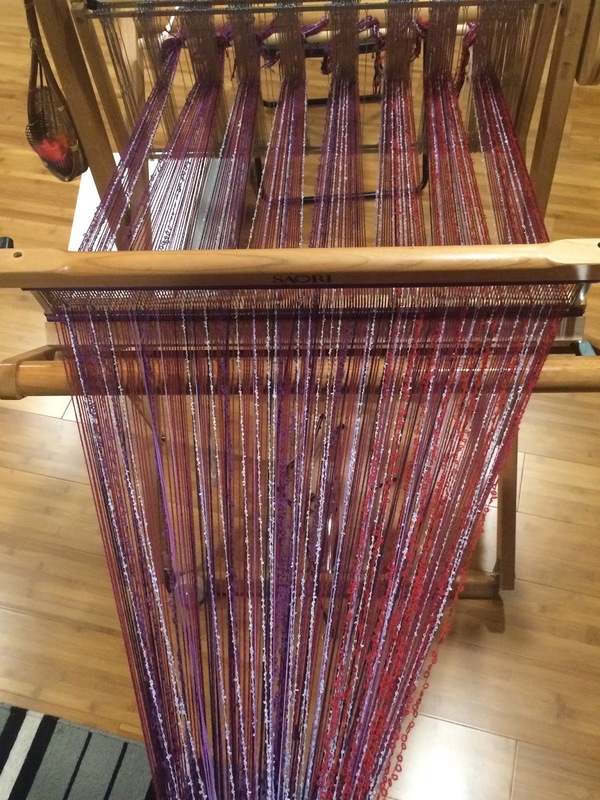 The next day the warp was wound and threaded. I put on the Star Wars sound tracks and started to weave. 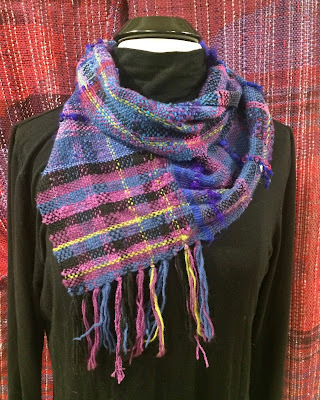 My goal, to have a scarf to weave for the December 17th opening of Star Wars 7 The Force Awakens. Finger Fringe at the beginning of the weaving. I was able to get my scarf done and a wallhanging for Jakob's room. Each one had some different things thrown it. I decided to title it, "Star WARP, The Fleece Awakens". That elicited a loud groan from by sons but that title will stay. 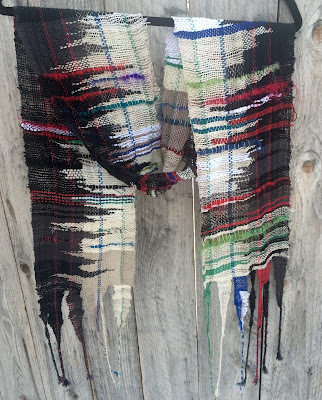 The weaving that became my scarf. One of the things Chiaki and I talked about while I was in Chaska was the possibility of doing a warp exchange. I would wind a warp for her and she would wind a warp for me and then we would see what direction the other one took it when it came to threading it and weaving it. After Thanksgiving we decided to do the exchange. We decide on a size and I began to wind my warp for her. 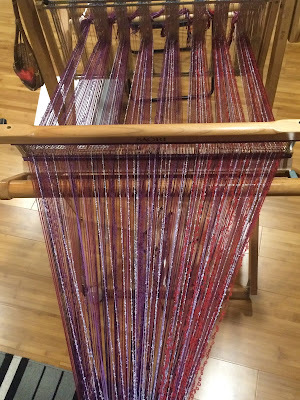 It was going to be the longest and widest warp I had done so far. (200 threads and 5 meters long) It was a challenge I was looking forward to with excitement and fear. Again when you are sharing things you are sharing part of yourself. I was so excited when I got the warp done that I packaged it up and sent it off to Chiaki in Minnesota with out taking a picture. I will add pictures after she sends some to me. 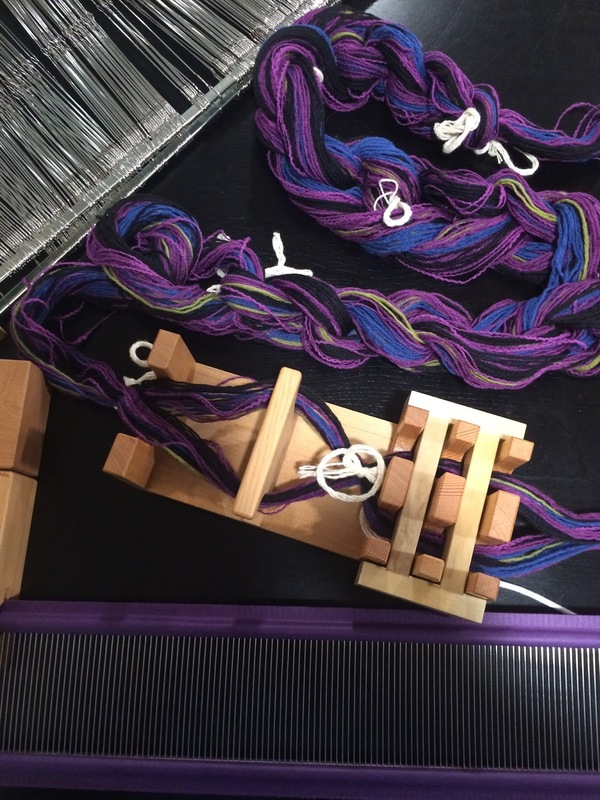 The warp Chiaki sent to me, threaded on the loom. 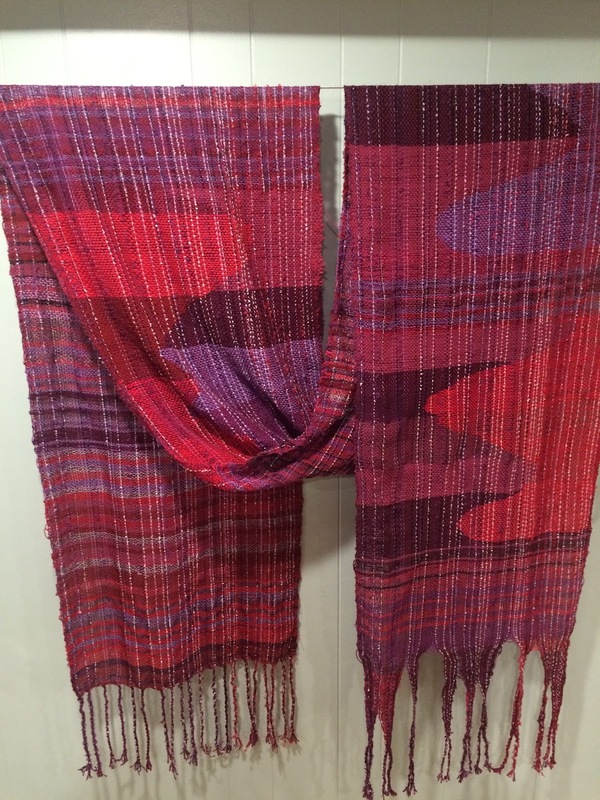 I threaded and wound the exchange warp and loved all the reds and purples she had put in it. There were also some great textured yarns in the warp so I decided I wanted to do a more simple weave. I gathered all my reds and purples and set out to weave from my heart on a very snowy December day. I looked outside and saw the snow piling up on the branches of the trees. When I went back to weaving I wove the curving mounds of snow. The completed weaving off the loom. I am not sure what this will become but with the drape and texture, it is bound to become something wonderful to wear. Total measurement is 52cm by 5 meters long. I learned so much in doing this warp exchange both about myself and about Chiaki. 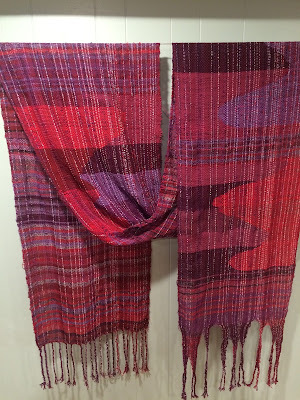 We both like warm colors, we each had different ways that we wound our warps and I learned to design at the loom. I think we will be doing more of these exchanges in the future and adding other people into the group. Whether you are in the same house or in different states, miles apart, you can still inspire one another and everyone in the group.